A Ferial Psalter is arranged for daily use, and so the Psalms are not arranged in their numerical order but rather according to the order of their occurrence in the Ferial Office. The various sections within the text are usually marked by a larger initial. During the Holy Week before Easter – the most important feast of the year – the different stages of the Passion of Christ are commemorated, visualized in seven extraordinary drawings (ff. 68-90) in ink with wash, colours, and gold, which were added by perhaps two different artists. 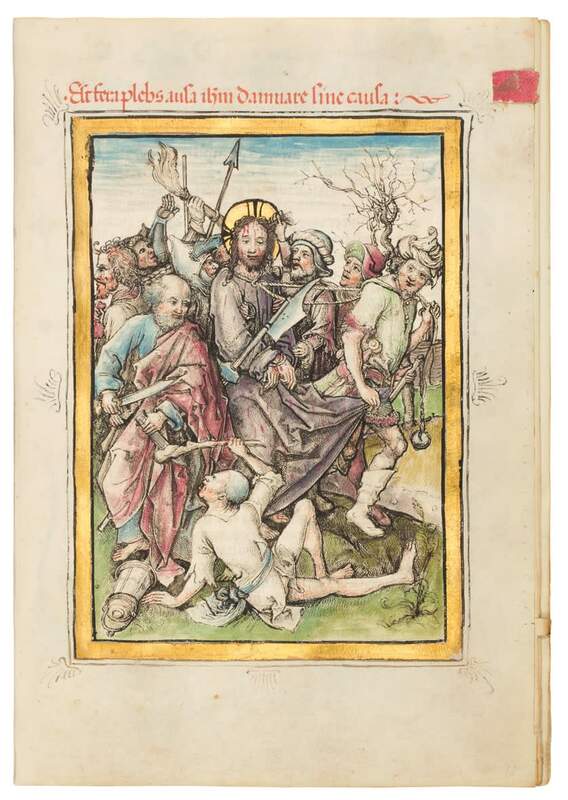 The illustrations, especially the Betrayal of Christ (f. 68r), pay homage to graphic aestheticism with figures rendered in shades of grey and highlighted with some colour. The firm outlines contrast with the soft modelling of some of the faces, achieved through expert application of wash – where thick pigment would have obscured details. In the Betrayal as well as in the Ecce Homo (f. 79v), the artist worked after engravings from the Passion cycle of Martin Schongauer. These engravings, dating c. 1475-1480, are among the greatest of their kind in their clarity of composition and in the handling of space and emotions. The other drawings in our manuscript seem to have been copied after woodcuts, presumably from a printed Passion cycle or a Biblia Pauperum. These special drawings served to contemplate the major events of the Passion. The artist expresses the devotional thoughts and feelings that are raised in the text. His drawings are endowed with a particular dynamism and offer the devot person first-hand observation of and communion with the Passion.